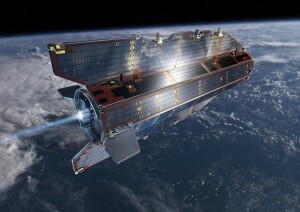 GOCE’s end of mission was declared today after the fuel tank ran out of xenon. The mission’s Spacecraft Operations Manager, Christoph Steiger, at ESOC, kindly provided an additional update. Following the drop of pressure in the fuel system of GOCE’s ion engine – below 2.5 bar – last Thursday, the engine initially kept working fine, however below its nominal pressure range. Starting Saturday, the engine’s performance grew more and more erratic, albeit drag-free mode could still be maintained. This morning at 03:16 UTC (05:16 CEST), at a pressure of around 1.5 bar, the engine was finally switched off by an on-board detection mechanism. Overall it’s been an excellent performance of the ion propulsion system, not only in the last few days when we went well beyond its design limits, but also in the last four years of drag-free flight! This morning the spacecraft was configured for orbital decay. This marks the start of the final phase of GOCE flight operations, in which we will keep operating the spacecraft as long as environmental conditions at extremely low altitudes allow.